Japanese researchers have been working on a new device that might soon turn the current way of snapping pictures with your cell phone into a thing of the past. Using a tiny device with a built in camera and sensors placed on ones finger alongside a rectangle gesture with your hands you can easily take a picture with no need for a LCD, viewfinder or taking your cell phone out of your pocket. The Ubi-Camera as it is known was developed by a research group at the Institute of Advanced Media Arts and Sciences in the city of Ogaki in central Japan. Framing an image with your hand is a typical intuitive gesture. 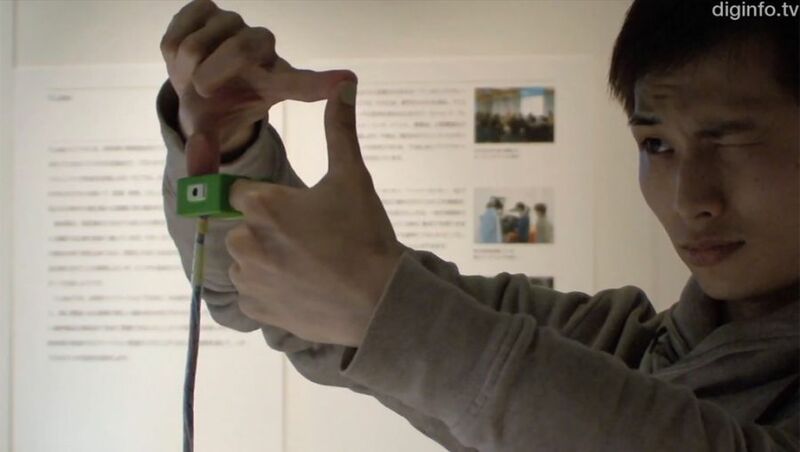 The Japanese researchers used this intuition to create a device that can take pictures effortlessly by simply holding your hands together forming a rectangle. The combination of the rectangle and the distance your hands are from your face will determine the composition of the image you take. A closer look will result in a wider angle while holding your hands far away from your face will result in a narrower angled image. Snapping an image is done by pressing a small bottom located inside the unit. Currently the researchers only have a basic prototype. They are working with a fairly cumbersome wired version with a fixed lens and an infra red sensor which detects the distance of the user face from his hands. However this sensor does not work very well outside. The researchers want the final version to be smaller, lighter, include a zoom lens and a wireless transmitter and to contain another camera instead of the infra red sensor that could track the user face. The Ubi-Camera isn’t a new concept. In 2009 researchers from MIT showcased project SixSense – an advanced wearable technology which among other things uses a small camera sensor warn as a necklace which can track a user movements including a similar intuitive framing gesture. However, SixSense is a much broader project with more ambitious goals to create a new type of input technology for a range of devices. Ubi-Camera on the other hand is very modest in compression, the project’s goal is to create a new type of intuitive camera – a goal which could be achieved in a much shorter timeframe (although no exact schedule has been given by the researchers and its currently unknown if a commercial product will follow the laboratory prototype). TFOT covered many cameras and camera related technologies including the Hasselblad H4D-200MS – 200 Mega Pixel Camera and more recently the BeetleCam – a robotic wheeled camera which completed a trip to Africa bringing amazing images of lions and other animals.